Hope's Cafe: ChicoBag Compact DayPack Review and Giveaway!! I love backpacks. In fact, I will quickly opt to carry a backpack-style bag over a purse or handbag. I know, I'm strange-my mom and sisters tell me that regularly! Presently, I am using a mini backpack for my "purse" :) So, when I saw the ChicoBag DayPacks, I was excited-not only are these reusable bags made with recycled material (go green! ), but they are super-lightweight, durable and compact! Very neat! ChicoBag sent me a DayPack20 for review; this bag has numerous delightful features. I like the fact that it is so easy to fold up and stash in a suitcase, etc. for future use. It also folds into the integrated zip pouch, which then turns into a zip pocket when the DayPack is open. 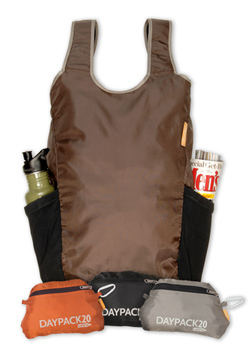 There are 2 pockets for water bottles on the side, so this would be perfect for taking on a bike or hiking trip. The straps are adjustable, which means it will fit just about anyone comfortably! I have been using mine every morning on our daily mail run. (Unless if it is raining out, we walk up to the post office to pick up our mail, and we usually come back with a good amount. So this is perfect for transporting all those packages back!). While the DayPack20 rePETe is lightweight, it is also extremely well-made and durable. I have carried a good amount of packages in it without any problems. Of course, that is probably due to the fact that it is made from (recycled) ripstop fabric! This is the perfect bag for anyone who needs a durable, compact backpack-type bag! And it folds down to this! "ChicoBag™ Company is equipping humanity with tools that will help eliminate the unnecessary use of single-use paper and plastic bags. We have done this by designing reusable bags that are durable, tasteful and most importantly unforgettable. We believe addressing even the largest of problems starts with small solutions. In early 2004, Andy Keller, now ChicoBag™ president, took a trip to his local landfill after spending the day landscaping his backyard. He was horrified by what he saw. Single-use bags were visually the dominant article at the landfill that day, blanketing the landscape in a thin mix of white and beige plastic. On his way home he began to notice plastic bags everywhere, caught in trees and on fence posts, half drowned in gutter puddles and blowing in the streets like urban tumbleweeds. That day Andy vowed to stop using single-use bags. Inspired, Andy dropped a few bucks on a second hand sewing machine and began sewing what would ultimately become the first ChicoBag™ brand reusable bag. Andy understood that a reusable bag was only valuable if it was reused. He knew his challenge was larger than designing any ordinary reusable bag – this reusable bag needed to be designed to be unforgettable. It needed to be small enough to tote in a pocket and have features that allowed it to clip anywhere. After countless hours, fabrics and prototypes the Original ChicoBag™ brand reusable bag, complete with an integrated stuff pouch and attached carabiner, was born. Andy’s ChicoBag™ brand reusable bags were first sold in 2005 on Earth Day at the Farmers Market in Chico, CA. Initially only available in white, the Original has evolved to include eleven color choices." ChicoBag sent me a DayPack20 rePETe for one of my readers!! Go to ChicoBag and tell me another bag you like!! 1 entry-"Like" ChicoBag on Facebook and tell them you entered the giveaway at Hope's Cafe! 1 entry-Follow ChicoBag on Twitter! This giveaway ends Monday, July 12, 2011, at 11:59 p.m. Please leave a valid email address in each comment, as this is how the winner will be notified. Winner will have 48 hours to respond, or another winner will be chosen. Disclaimer: I was not monetarily compensated in any way for this post. All thoughts and opinions are mine. All quotes taken from the ChicoBag website. I like the duffle rePETe bag. I visited ChicoBag and I'd like the Vintage collection and Don't Feed the Bag Monster! I followed @ChicoBag on twitter. I like the CHICOBAG DUFFEL rePETe. I like the ChicoBag Duffel! Thanks! I like ChicoBag on FB and told them I entered! I like the CHICOBAG MESSENGER10 rePETel and the bottle sling! COOL! Thanks!! I would love to have the Chicobag Bottle Sling! I liked the ChicoBag Vita in the Spring Blossom designs. Liked ChicoBag on Facebook as Lynda Clark and told them I entered your giveaway. I like the: CHICOBAG PRODUCE STAND - COMPLETE STARTER KIT.